Clean and spacious. Well maintained vintage mobile ready to move-in. 1,488 sf 2 bedroom, 2 bath with large living/dining room and separate family room. 6,800 sf lot backs to open space with access to hiking and riding trails. Step into large living space with lots of windows, a new pellet stove, built-in entertainment center with desk and formal dining area with a built-in hutch and mirror. The kitchen is roomy with nice views and includes updated appliances, a double well sink, breakfast bar and a pantry. Have fun with the retro colored counter tops which are in great shape. The separate family room is off the kitchen and features glass doors to the oversized covered deck. A perfect place to hang out. Washer and dryer are included in the laundry room. The guest bedroom connects to the guest bath and features a walk-in closet. The master bedroom is located at the rear for optimal privacy. It is spacious with a large mirrored closet in addition to a small walk-in. The master bath features double sinks and a corner tub/shower with seating. This home is perfect for full or part-time living. Easy maintenance metal shiplap style siding has been recently painted. The 62â carport will accommodate cars as well as all of your lake toys. The 30-gauge galvanized one-piece roof has never leaked. 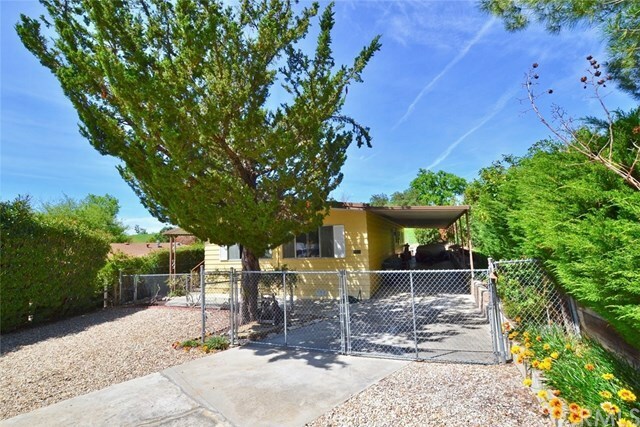 The yard is completely fenced and gated for all of your furry family. Bank financing is available to qualified buyers. Enjoy all amenities of Heritage Ranch.